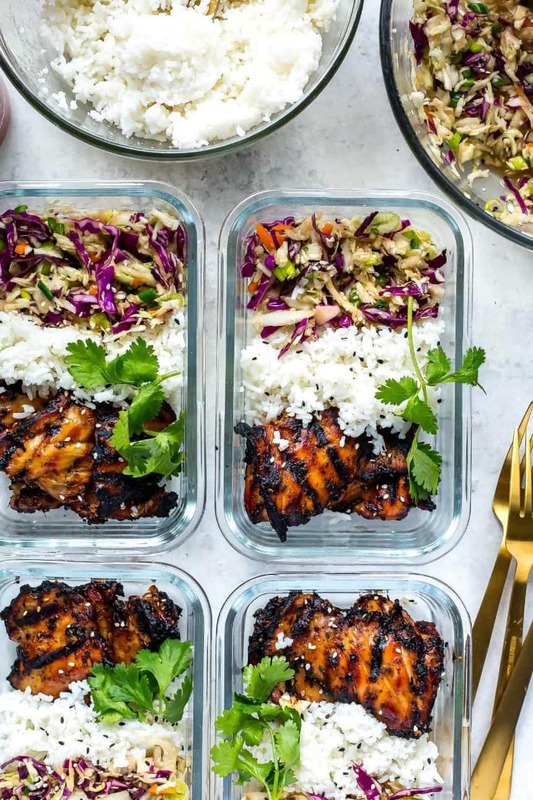 Home > Recipes + Food > Easy Family Dinner Ideas > Chicken Meal Prep Bowls that Will Help You Get Through the Week! 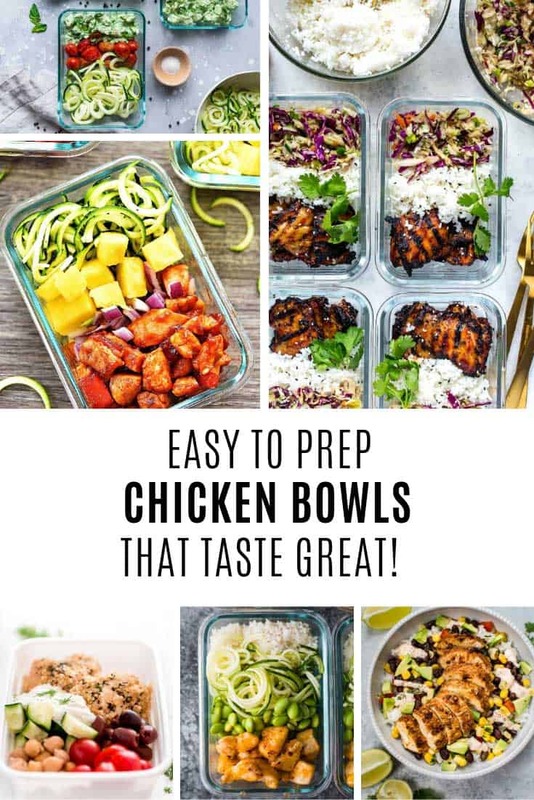 These chicken meal prep bowls make perfect make ahead lunches or dinners, you can put them together really quickly but they still taste amazing! 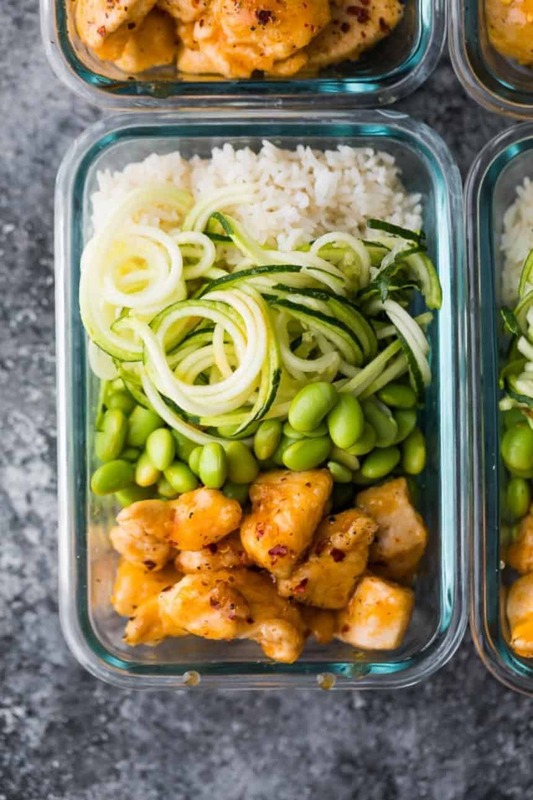 Whether you’re meal prepping your lunch or your dinner you’ll want to mix things up every now and then to make sure you don’t get bored and give up. Which is why today I’m bringing you 10 different chicken meal prep bowls that look as amazing as they taste! 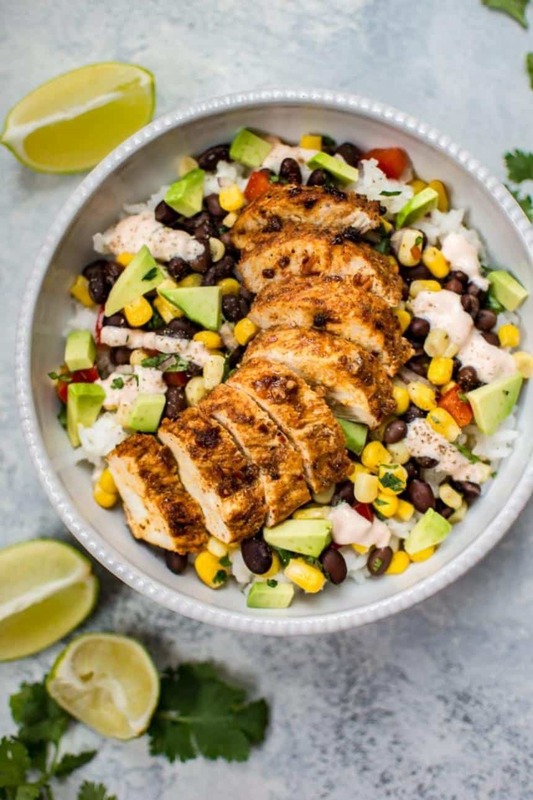 As the name suggests these Spicy Chicken Meal-Prep Bowls are loaded with spices like paprika, coriander and red pepper so they’re the perfect choice if you love your chicken to have the wow taste factor! This recipe is paleo, gluten free and keto compliant too. 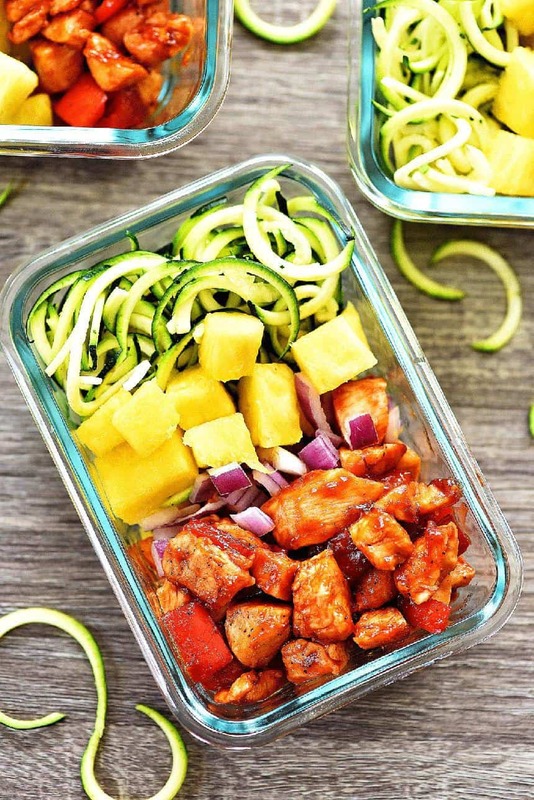 Taylor’s family has been eating this Korean chicken for years but she’s been tinkering with it recently to make it more healthy, and added an Asian coleslaw and jasmine rice to make it the perfect meal prep lunch idea. If you don’t want to be stuck inside cooking on a sunny Sunday afternoon you can even make this outside on the grill! If you really want to save time on Meal Prep Sunday the best thing you can do is invest in an Instant Pot. This recipe is a great example of how to use it because you can cook your chicken and quinoa (or rice) at the same time! These Healthier Firecracker Chicken Meal Prep Bowls are spicy and sweet with a tangy twist and not only is it a healthy version of regular firecracker chicken it’s much quicker to make too! If you’re new to meal prepping this recipe includes a video (right near the bottom) where Denise shows you exactly how to make it. 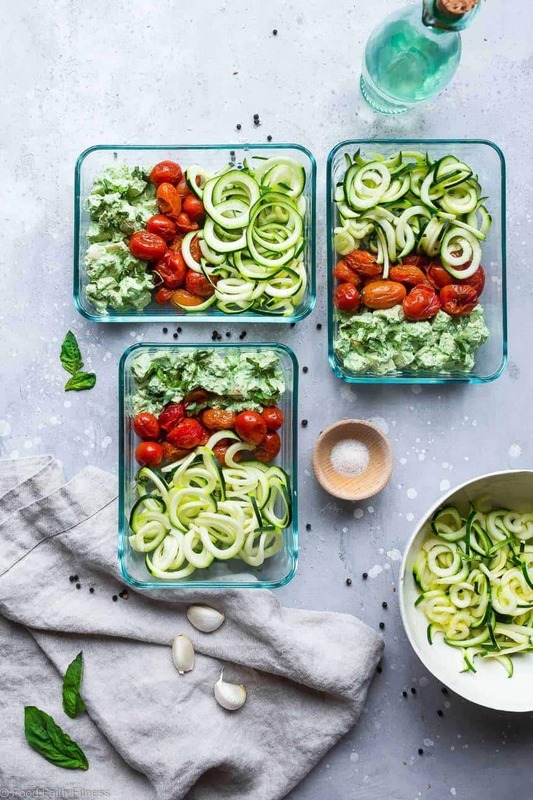 You’ll need to grab the spiralizer for this meal prep lunch because it includes zucchini noodles although you can also switch things up and use asparagus as a side too. The chicken itself is cooked with a barbecue sauce to give it a lovely kick. You’ll make 6 to 8 bowls depending on how much you put in each container, and it will keep in the fridge for up to four days. 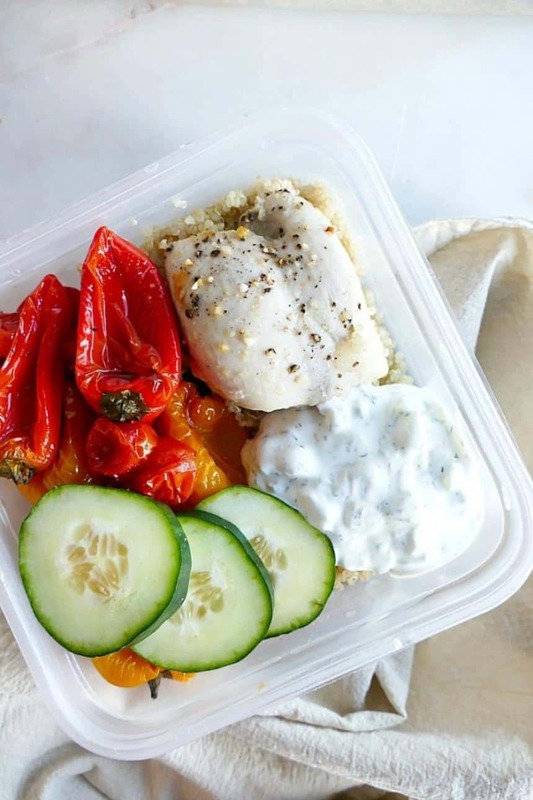 If you’re looking for a healthy meal prep lunch option that is totally balanced then you need to add these Greek Chicken and Veggie Meal Prep Bowls to your plan for next week. 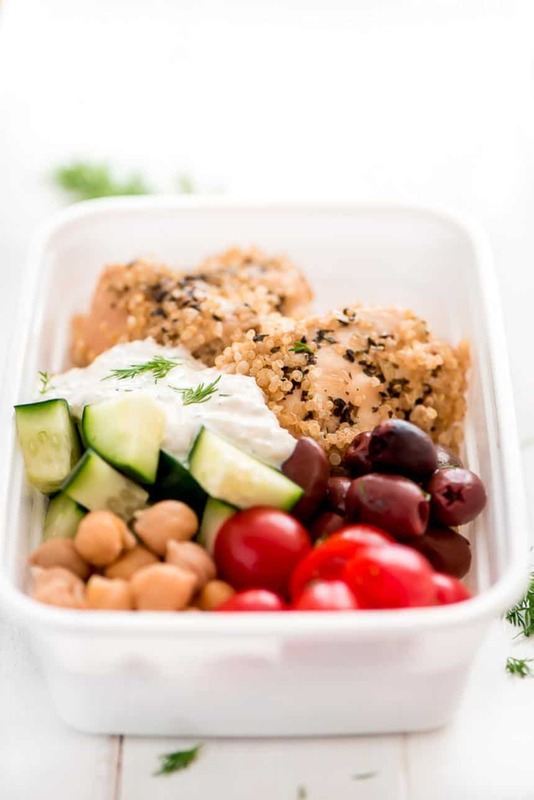 They are made up of the big three: protein (chicken, quinoa), fat (whole milk tzatziki), and fibre (quinoa, ALL the roasted veggies) to keep you full for the rest of the afternoon. 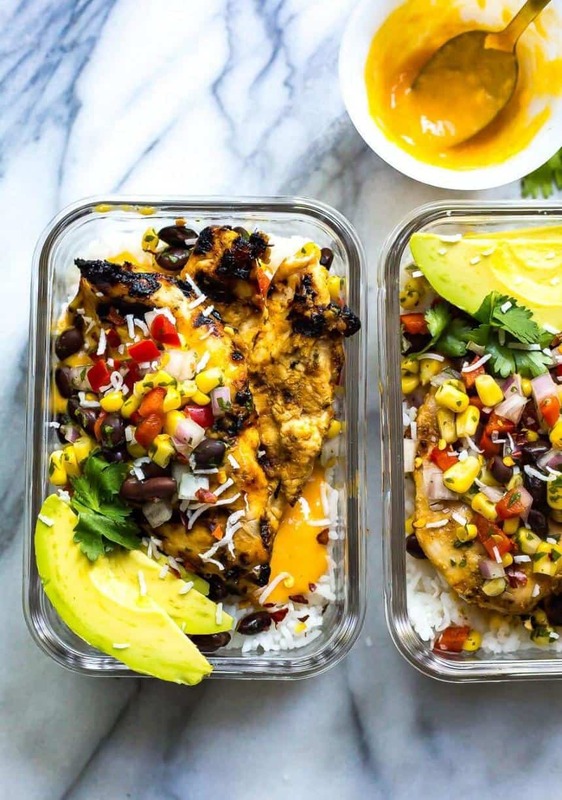 If you are dreaming of summer and sun drenched beaches you need to give these Coconut Mango Chicken Meal Prep Bowls a try next week. Just look at the vibrant colours and the combination of coconut and mango totally screams summer! Taylor also has a great trick for cutting your meal prep time down, and it’s all about what you do with the marinade! You know when you meal prep your lunch you don’t have to eat it from a glass or plastic container right? 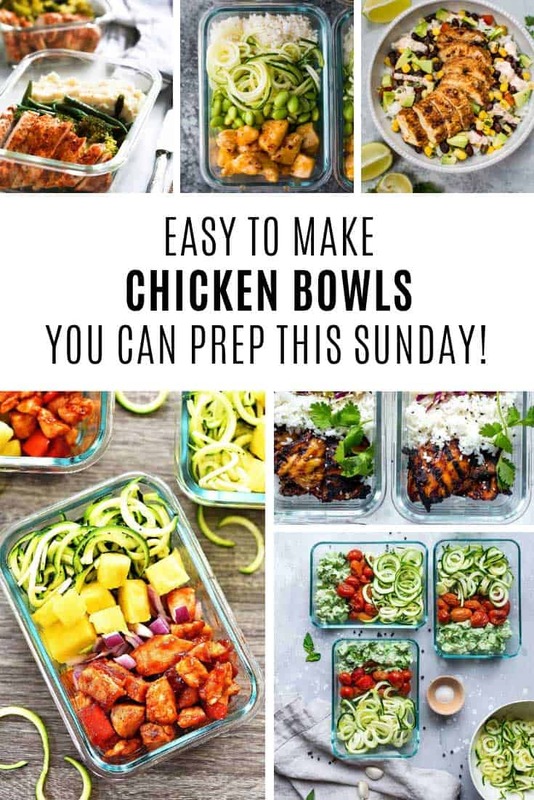 Any of these chicken meal prep bowls can be eaten from an actual bowl, well unless you just don’t like doing dishes in which case why dirty something else! Anyway, back to these super easy taco bowls, which come together really fast and because the chicken is marinaded in a southwest seasoning it really packs a punch! 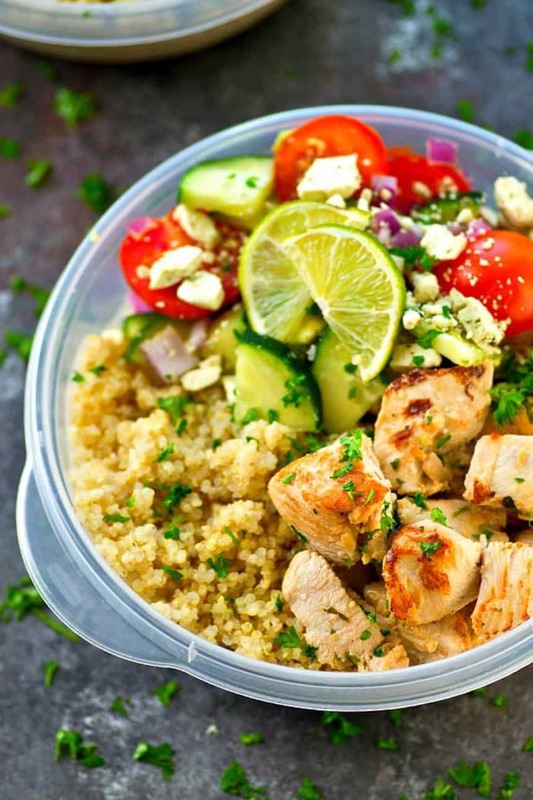 If you fancy giving Greek a try next week then try these Meal Prep Greek Chicken Quinoa Bowls, which taste so good they will most likely become a permanent part of your meal prep menu rotation. 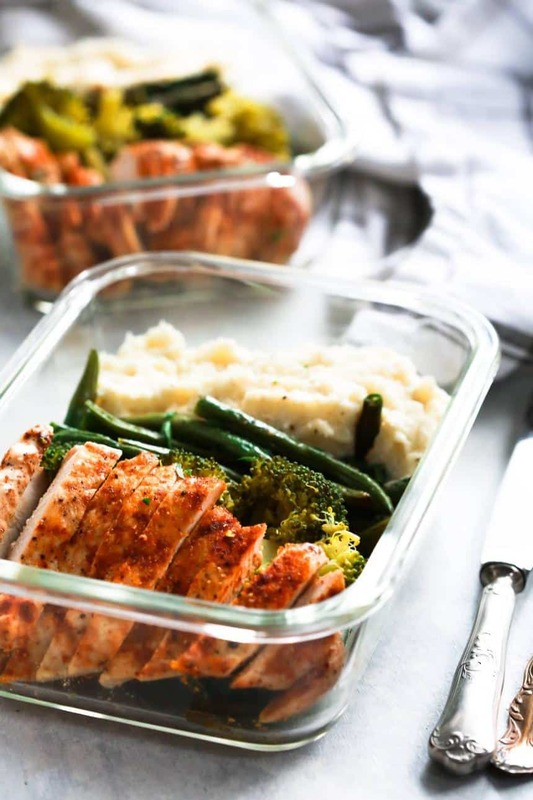 And just in case you’ve only been meal prepping your lunches up until now it’s as good a time as any to remind you that meal prep dinners are the perfect antidote to those super busy weeks when you don’t have time to cook from scratch at dinner time! If you’re looking for a protein packed meal prep lunch that’s gluten free and low carb then give this one a try. And yes, it really is low carb because the “pasta” is actually zucchini noodles!